rec. Sept 2000, Studio Marine, Carrières-sur-Seine, France. Legitimisation of the classical guitar as a concert instrument is only a relatively recent occurrence. During the 1960s few classical guitarists, especially in comparison with players of other stringed instruments, were capable of performing to concert standards typified by Andrès Segovia. Ranking well in this elite hierarchy was Brazilian player Jorge Morel who ventured into a different and very dynamic genre that embraced the music and style of his native country. His recording �The Artistry of Jorge Morel� (RCA LSP-3953) released in 1968, was unique for several reasons. This once-heard-never-forgotten LP was soon deleted from commercial availability and became a rarity in second-hand shops. Currently AM Publishing (UK) promotes a number of recordings by Morel, which represent much of his repertory. Jorge Morel is a guitarist-composer whose superior arrangements go beyond that status and almost become new compositions in their own right. America from West Side Story is one of a medley of three that he recorded; the others are Maria and I Feel Pretty. Morel originally heard Misionera by Fernando Bustamante performed on harp and piano with guitar accompaniment. He enthusiastically arranged the work into a fabulous guitar solo. Comparisons between the Morel versions and those by Vincea McClelland are very interesting and revealing especially given that they are separated by almost four decades. No one plays the Venezuelan waltzes of Antonio Lauro like fellow-countryman Alirio Diaz (Guitar Music of Spain and Latin America, EMI HQS 1175). While Graham Anthony Devine�s rendition of Sete Cordas is laudable (Guitar Music from Brazil, Naxos 8.557295) the same music played by its composer Raphael Rabello (Cry, My Guitar, GPS 1010CD) demonstrates intrinsic dimensions that only he can extract. In similar vein Morel�s arrangement of America from West Side Story (b.1) and Misionera by Bustamante (23) as played by McClelland are devoid of the vitality and virtuosity with which Jorge Morel manages to endow them in his 1968 recording. This is an observation not a criticism. In playing this type of music Morel is an impossible act to follow and the renditions by McClelland are in any event very well performed. 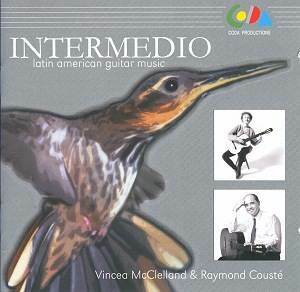 Intermedio presents Latin-American music for guitar or music that has been arranged for guitar. Of the 28 tracks, 17 are for solo guitar, 10 for duo; in one the music is played solo as originally written and then embellished with a second guitar part. The Suite Latina by Venezuelan Alfonso Montes, was written over the period 1987-91. Milonga al sur (2) is dedicated to Astor Piazzolla. A common title given to South American compositions for guitar, Milonga is the name of a late 19th century dance from Buenos Aires, a forerunner of the Tango. The eleven studies for guitar (8-18) were composed by Cuban guitarist, composer, percussionist and conductor Leo Brouwer. His works for guitar are performed more than any other living composer. Perhaps most famous of all Latin American composers for the guitar is Agustin Barrios Mangoré whose magnificent legacy includes more than three hundred solos. The guitar�s matchless evocative powers are no better exemplified than in the luminous and ethereal Cancion de la Hilandera (25). Jorge Cardoso, a native of Argentina, is a qualified medical doctor. An accomplished composer he has more than three hundred compositions to his credit. Should any of these attain immortality in the world of the classical guitar it will certainly be his Milonga from a collection entitled 24 Piezas Subamericanas. Born in 1951 guitarist-composer Paulo Bellinati is from São Paulo. His neo-classical style of composition has been suggested as reflecting the more cosmopolitan character of his southern birthplace in contrast to the more exotic of flavour Rio de Janeiro and the northeast-region of Brazil. Contatos (24) is a Portuguese word meaning �Contact�. Now based in Paris, Vincea McClelland was born in Montreal and obtained her Bachelor of Music in Performance from the University of Toronto where she studied with Eli Kassner. She has also studied with Oscar Ghilia and Alexander Lagoya. Her solo CD �Guitar Originals" was described by the French magazine Les Cahiers de la Guitare as �the CD of a great lady of the guitar�. French guitarist and lutenist Raymond Cousté has a vast performance experience having appeared in over one hundred countries worldwide as a soloist and member of various ensembles. After studying guitar with Ramon Cueto he later obtained a degree in solid-state physics. He continued musical studies with Alexander Lagoya receiving his Premier Prix (Diploma with honours) in 1972. He is married to Vincea McClelland. Transcriptions and arrangements for two guitars often have their genesis in the inability of music to be performed on one instrument. This part of the repertory probably exceeds that originally written for two guitars. Music written for solo guitar may also be arranged to accommodate a second guitar; it is to be hoped with a result superior to the original. A review programme highlight is the beautiful Milonga by Jorge Cardoso (28). The solo portion of this rendition by McClelland is most enjoyable and transcends a previously favoured version by Göran Söllscher (DG 459 138-2). But the spell begins to dissipate when the second guitar part, by the composer is added. Originally written for solo guitar this is good example of �more is less�. Cousté�s contribution is sound but an unnecessary addition to a composition that needed no improvement. One could argue that the history of transcriptions and arrangements for guitar abounds in such initiatives, albeit not usually related to original compositions for the instrument. The eleven studies for guitar by Brouwer are very well played but their essentially didactic nature may challenge some listeners less dedicated to the instrument. Tango en Skai by French guitarist-composer Roland Dyens is one of his most recorded works. It is a caricature of the Argentine tango, and skai in French means imitation leather. Comparatively the rendition by McClelland has some interesting phrasing; some may suggest that the version by Elena Papandreou, to whom it was dedicated, (Naxos 8.554001 and BIS CD 1366) is closer to that intended. Intermedio is an enjoyable recording with a generally well-crafted programme. Capably embracing the challenges of Latin American music for the guitar it reintroduces listeners to some long-neglected treasures of the guitar repertory. Vincea McClelland is an adept guitarist and produces a beguiling sound on her fine Alejandro (Málaga 1991) guitar. While a skilled duo player, there is less virtuosic opportunity for Raymond Cousté to display the credentials for which he is renowned. Whether some of the items for duo guitar strengthen or weaken the programme is a matter of opinion but this writer would prefer just the complete McClelland solo version of Cardoso�s Milonga. The accompanying booklet in English and French is informative, contains numerous colour photographs, and represents a production standard which equivalent publications rarely reach. This recording has been around for several years but those who may have missed it can confidently add it to their priority wish-list. For a treat scour all possible resources for an original recording by Morel. Morel�s arrangements are notable for their consummate artistry and incomparable excellence.